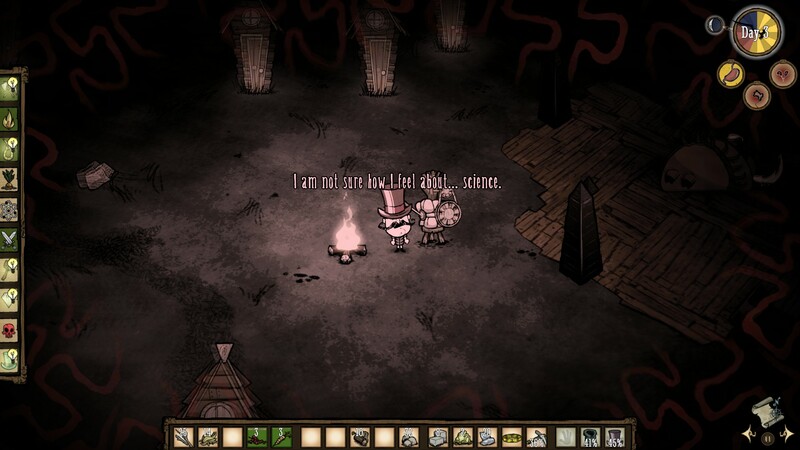 You play as one of eight playable characters, starting with Wilson: the Gentleman Scientist (“I will conquer it all with the power of my MIND!”). Each character has their own special abilities and conditions with varying graphical details. Wilson, for instance, grows a Magnificent Beard which can be used as a crafting material later in the game, once you shave it off with the Razor. Yeah, the game is that weird. Oh, and the voice acting is all done by musical instruments. 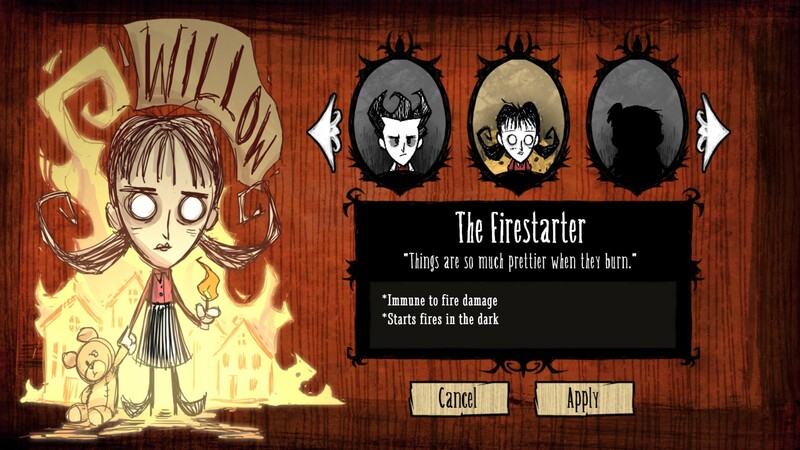 Another example with Willow, the first unlockable character, nicknamed: the Firestarter (“Things are so much prettier when they burn”). The additional characters are unlocked as you gain experience, which is earned by surviving as long as you can. The more days you survive, the more experience you get, and you get lots of it if you manage to complete Adventure Mode. This is a game of exploration. Discovery. Sure, you will one day get accustomed to the mechanics and the items like we all did with Minecraft and Terraria, but it is an experience on the first play-through. From first meeting Maxwell, to finding your first Pig Village, to building your first Science Machine. It’s fun to just find these odd things and wonder what you could do with them. The game aims to create a weird balance between magic and science. You build your own tents and farms for survival, while finding weird items in the world like the things, which build a portal to the next world. Science and logic are vitally important to tackle this world, full of magic and strange creatures. It’s awfully similar to the real world, except with everything being different. 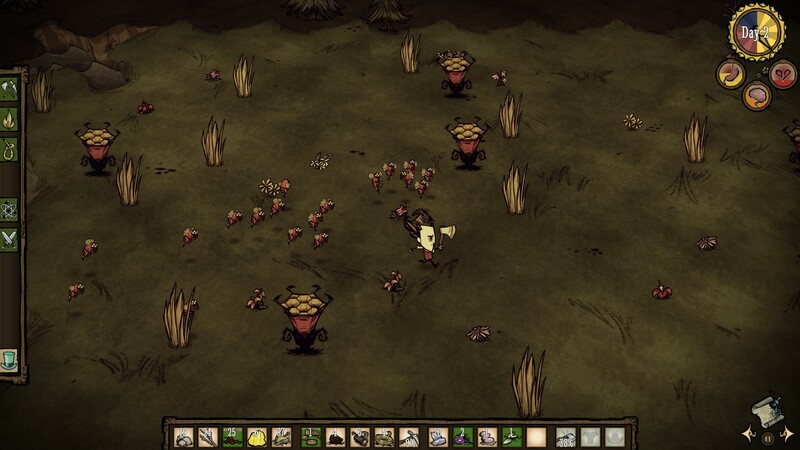 For example, you can take the hair and meat from the wildlife to survive, but in Don’t Starve the main source for this is Beefalo. You can shave them while they sleep for wool, or hunt them down for meat, they also go into heat and can get angry. Really angry. Beefalo are found in the savannah, one of the many biomes in the game. Other biomes include the forest, grasslands, marsh, rockyland, mosaic, and the ultimate ‘Maxwell biome’. Each one typically has its own wildlife and plant life, each worth exploring as they vary significantly. There are also pigs, but in this game, they are humanoids that run around all happy and content with their little lives. Feed them meat and they will form an army to follow you. Pigs will turn into Werepigs when there’s a full moon, too. There is also a Pig King, who you can give stuff to and he will repay you with gold nuggets (used to build the Scientific items and better equipment). The pigs seem to have created a civilized nation. It’s easy to get distracted by the –ooh, wormhole! In Adventure mode, a new world is generated and the player is dropped randomly into this world, within a relatively safe area, where you can find your bearings. Dangers around will most likely be spider dens and beehives. A spider den, at the beginning, will be a big ball of webbing attached to the floor and will spit out just a few spiders – not a challenge at all, though that isn’t to say that they are worth attacking without some preparation. As the game progresses, however, these dens grow, so far in that a Spider Queen will be spawned as a den reaches the end of its life span. The aim of the game, clearly, is to not die of starvation. Pretty simple goal, right? Well yeah, it is really. But it is certainly not an easy one. Be mindful that you now also have to watch your sanity (a fairly new feature to the beta), which drops a certain amount during particular times and when certain events happen, like eating spoiled food or ‘evil’ food. Sanity goes up when eating healthy food and sleeping in reasonable conditions (such as in a tent). Basically, pretty much everything wants to kill you eventually. In Adventure Mode, it is up to you to find the mysterious Maxwell, the guy who put you here, and to learn the secret of what is going on in this world. There are five worlds in total to progress through, each randomly generated. You need to find certain items that, when combined together, build the Wooden Thing and open a portal to the next world. This requires exploration (and survivability) to find these items and create the portals. Your first day, like in many survival games, will be spent gathering supplies: finding twigs, wood, and foraging nibbles from berry bushes. Basically anything you can find that isn’t nailed down. Spider dens and beehives are pretty avoidable near the beginning, so the main danger to watch out for is night time. Having the materials necessary to build a campfire is essential, so the night-nasties don’t get you, but this is by no means any difficult task. All you need is some wood and cut grass and you’re good to go, with some extra weeds or more wood to fuel the fire during the night. It is easy, however, to get distracted with the many curiosities within this world. There are three stages to each day: day, night and the in-between bit, dusk. It doesn’t go completely dark at dusk, but it goes dark enough that you need to start thinking about stopping and finding a place to rest. Dusk goes on for far too long though, leaving you to continue hunting supplies until night time unexpectedly drops on you. This shouldn’t happen though, if you pay attention to the dial in the corner of the screen that tells you what time of day it is. Once night time comes, you need to start the campfire. If you don’t, the invisible night-nasties will get you. When you walk around in the pitch-black dead of night, you get damaged and killed pretty quickly if you are not near a light source. Creepy noises follow you, eyes stare at you, and you get slashed in the dark. The user-interface (UI) is used to demonstrate some of the happenings in the game. In fact, it’s a shame that this isn’t used more often. When your sanity drops too low, the game shows you with the interface, as red tendrils appear on the screen, audible whispers play and rabbits, of course, turn into little beardlings (evil beard creatures, good for farming beard hair!). The time of day also varies depending on the season. 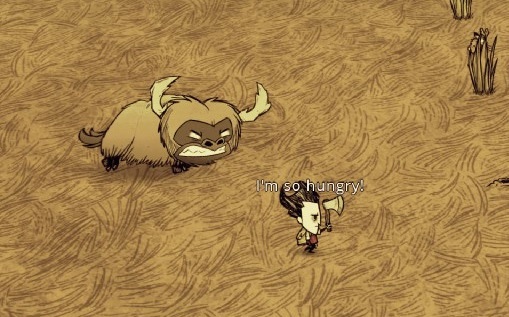 Don’t Starve does a convincing job of subtly changing between summer and winter. The weather varies as well, making the eerie theme even darker when it starts raining. During winter, the floor freezes over and surviving becomes much more difficult, as everyday tasks become challenges. 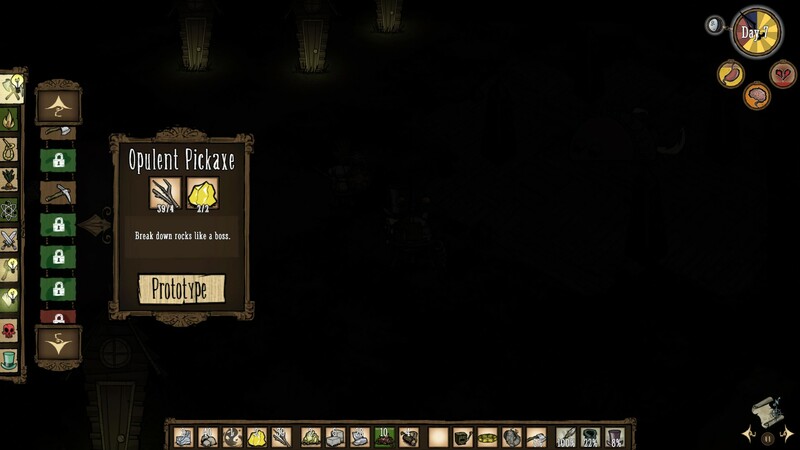 There are so many ways to die in this game, starvation is just the tip of the beefalo farm. Freezing becomes a very real problem and you need to dress up in winter clothes just to keep warm. Again, the items in the game are so varied and creative, you can build odd contraptions – with SCIENCE – that can be used to keep warm. 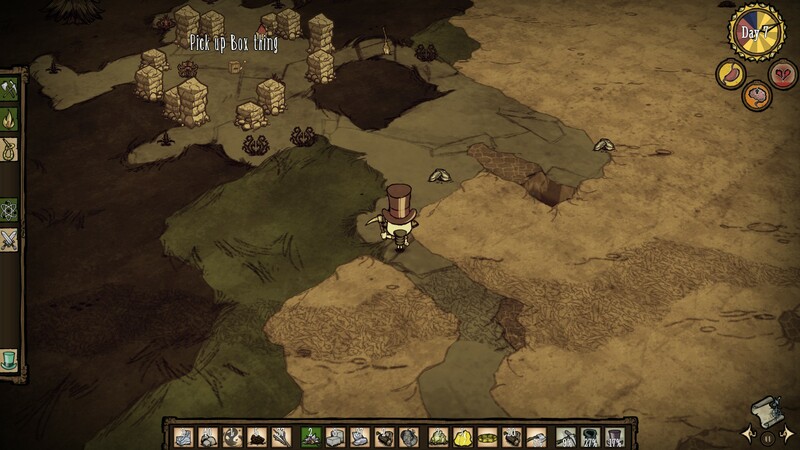 It is an amazing adventure, working your way through Don’t Starve. Like Alice in Wonderland, it’s a very apt comparison with the odd variations of regular creatures and strange characters you meet. Sometimes a game manages to create a world full of interest and curiosity, which the player feels like they must explore and find every little detail. This leads to a provocative journey, mostly of strange ways of dying, at least on the first few attempts of finding Maxwell. 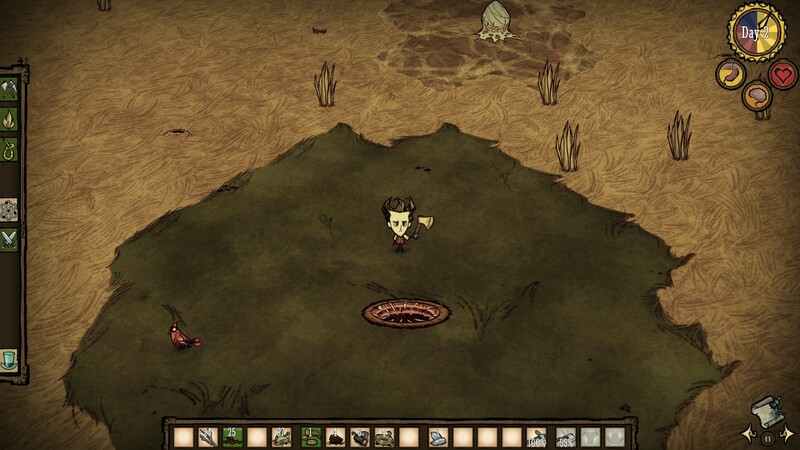 Don’t Starve will be released later today on Steam. You can get it there or from the official website directly – which comes with keys for Steam and Google Chrome, as well as a stand-alone download.